How long has it been since you last gave your brain a proper workout? Can't remember? Well, then you might want to give these quiz and trivia games a try. We have picked 10 of them, available on both Android, iPhone, and iPad, with questions ranging from simple and casual to fiendishly challenging. All of them are free or have a free version available, so don't hesitate to check out every single one of them. Multiplayer is also a feature present in most of the titles we've selected, meaning that you may challenge your friends or people from around the world. Take a look by flipping through the slideshow below! This is the world's first game to contain both flatulent sounds and trivia about Shakespeare. You Don't Know Jack includes hundreds of full episodes of the popular quiz show trivia game, with new, topical episodes added every week! You can play against friends or challenge random strangers. Based on the popular TV show, this app tests your knowledge with questions that even 5th graders should know the answers to. Challenge your Facebook friends and other players as you try to answer the thousands of questions in the game's database. Here's one more quiz game with thousands of questions to challenge your knowledge. Categories include television, celebrities, music, movies, science, sports, technology, and more. Additional questions can be downloaded via in-app purchases. Compete against your friends, the world, or your own self in this multiple choice trivia game. 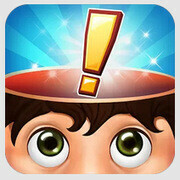 The game is free to play, with new questions added on a daily basis. Players are allowed to submit their questions as well. 1700 questions, 17 categories, 3 lifelines - that's what Quizoid has to offer. The game has no flashy graphics or fancy features, but it is challenging and fun to play. Here's a game you've surely played already, now in its digital form. There are thousands of words in its database, with new ones being added every day. Here's a trivia game with a twist. In Quizboard, the player must answer trivia questions to move across the spaces ona board. The more questions answered in a row, the higher the player's score will be. You can block your opponent's way by crossing their path. There are over 14 000 questions to answer in this game. Yet another unusual trivia title – Quizcross – blends the classic tic-tac-toe with a multiple answer quiz game. There are three questions for each tile, and outsmarting your opponent will grant you the spot. Cited as one of the best trivia games on mobile, Trivia Burst has over 50 000 questions across 25 categories. You're free to test your own knowledge, or challenge your friends and people from around the world. This is a trivia game made with multiplayer in mind. With its asynchronous multiplayer feature, you can challenge your friends anytime, anywhere. There are lots of game types and question categories. Questions on images are included as well. I liked the post. I play a lot like a game called Atriviate. It's like Trivial Pursuit but much better. You can play online with your friends and other people. You can check out the trivia game "What D'Ya Know?" for iOS and Android too. There's a free version that has lots of questions and free downloadable question packs. And there's other questions you can buy too. Just played the Doctor Who question pack and it was hard and I'm a fan! You might want to check out "The Hardest Quiz in the World" on the Play store: play.google.com/store/apps/details?id=com.scaladro​id.wikiquiz An interesting quiz because the questions are automatically generated in real time from wikipedia content.